One of the perils of living in the former British Raj colony is it's obsession with upcoming Royal Wedding. Will and Kate are everywhere - newspapers, magazines, on the radio. Two rich and priviliged kids, who are living far away are getting married. Who gives a flying fig? Tons of people apparently. There are big fancy viewing parties are scheduled all over Dubai, which i imagine will be attended not only by UK citizens. Well, one useful bit of info (at least for me) came out of this - local newspaper, The National published recipe of Prince William's favourite dessert, Chocolate Fridge Cake. 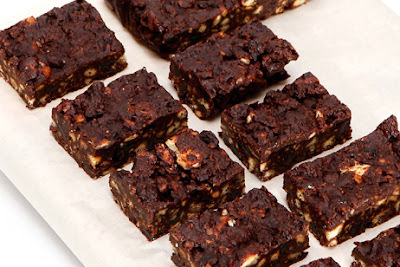 It looks easy to make, delish to eat and i think it's a chocolaty staple in the UK - Jamie Oliver has the recipe, so does grocerey chain Waitrose, chef to the royals Carolyn Robb, etc. Use cling film to line a 20cm (8in) shallow, square-shaped tin. Leave extra cling film hanging over the sides. Melt chocolate, butter and golden syrup in a heatproof bowl set over a pan of simmering water. Stir occasionally. Remove the bowl from the heat and stir in the broken biscuits, apricots, raisins and pecans (optional). I'm making it with my kids on April the 29th. I think the Royal Wedding Fever is contageous - Long Live the Queen!